Recently, an Indian movie has burst into popularity in theaters. It is said that Indian audiences will all stand up spontaneously and warmly applaud while watching this movie, the movie box office is excused from taxes in four states of India. The movie is Dangal. Currently, Dangal scores 9.3 in Douban. The movie is adapted from real people and real events, narrating a Indian ex-wrestling champion Mahavir Phogat(played by Aamir Khan, who has ever played the leading role in 3 idiots, giving up his favorite wrestling sports because of the pressure of survival. But, the dream of wining a gold medal on behalf of his country has always been in his mind. So he put this dream on his son, hoping his children could achieve this dream. Maybe placed by the destiny, or the next story is the arrangement of the destiny. Phogat was full of expectation only to be let down when he got a daughter. Therefore, the whole village started to provide a variety of folk prescriptions for getting son, every possible alternative therapy has been tried, but nothing has turned out to be useful. His second, third and fourth child were all girls. Because of the fate’s cruel joke and questions raised by the villagers, gradually Phogat began to give up his dream. “ You can’t always live in the past”, his wife talked to him. 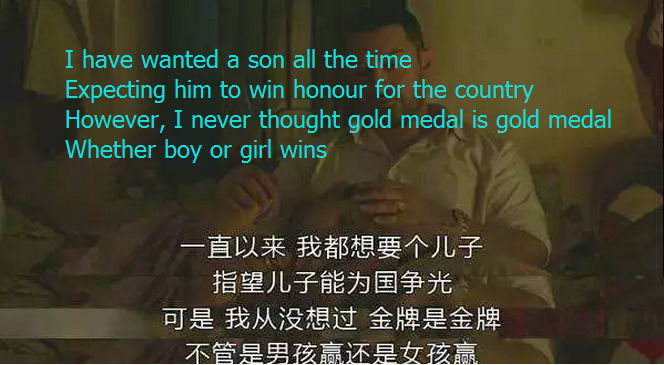 Finally, he took the gold medal from the wall, and gradually became an ordinary man, supporting his family. Until that day, his passion for life was reignited. That day, Phogat was back from the market, a couple of the village came to his home to complain about their children being beaten black and blue by his first and second daughters. After the neighbor left, the two daughters thought they would be criticized by their father, unexpectedly Phogat only asked: “how did you hit them”? Then the two daughters did an experiment on their cousin, displaying the full plot to their father. Just at that moment, Phogat discovered his two daughters had the potential of being wrestling champion. At that night, he told his wife that he planned to train his first and second daughter to be world champion. 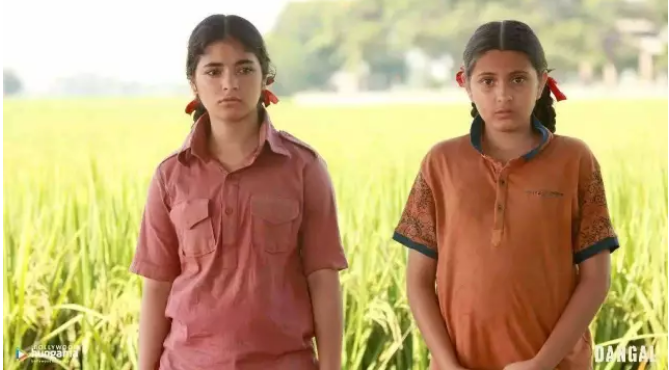 From that day on, they were forced by their father to start devil training, and accordingly, their childhood ends, snacks, skirts, party, etc, all disappear, even the long hair which Indian girls attach great importance to were cut short by their father. Certainly, they have ever complained, until one day, one friend who was about to get married talked to them: “how I envy you for having such a father! 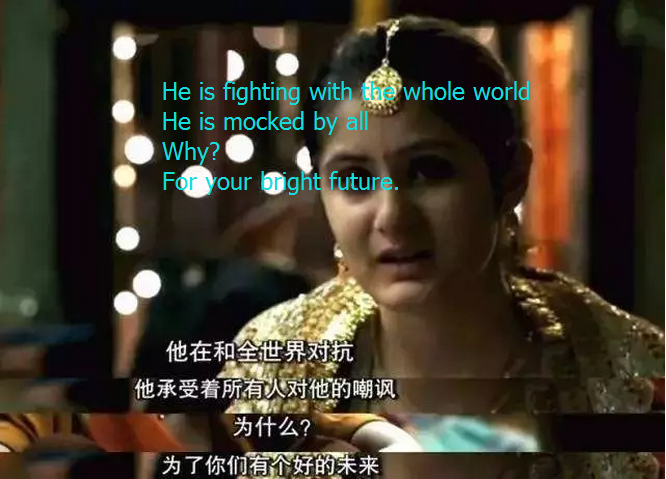 He will make you become the master of your own destiny, unlike other Indian girls, they have to marry a man who they have never met at a young age, then do housework all their life. He shielded from wind and rain for you, what he did was for your future, he is fighting with the whole world, he is mocked by all, why? For your bright future. They understood their father’s pains until that moment. Although their dad trained them for his unfinished dream, meanwhile, he was helping them to change the fate. In spite of being questioned and laughed, even complained by his children, the father never gave up to help them get rid of Indian traditional girls’ fate, become others’ example. Therefore, the two Sisters began to do passive training, being the champion also became their dream. Certainly, on the road to win the world champion, they have gone through countless hardship, pain, confusion and struggle, nevertheless, the power of love can’t be stopped no matter how great the difficulty is, the parents will never give up their children however ignorant their children are. At last, Gita won the first prize in wrestling at the 2010 Commonwealth Games – woman’s freestyle 55 kg, being the first female athlete who has won the world champion of wrestling in India. Some netizens don’t agree with the father’s education way, even he helped his daughters achieve great success at last. They called him”a dictator”, and thought he was abusing his children. However, other netizens opposed that criticism. “This could be Aamir’s best performance till date. Yes, even better than Lagaan. A man is making his daughters chase his dream. He cries, frowns, gets angry, looks old and tired, but is definitely one of us. Doing anything, only try your best can you have the chance to succeed, just like Chuangxinjia, Chuangxinjia has entered e-commerce industry since 2008, starting with only 4–5 marketers, through years of efforts, more than 240 sales staff up to now, now the company has expanded to 5 subsidiaries and has won multiple awards, becomes the global top ten enterprise, the state-level high-tech enterprise, Shenzhen high-tech enterprise and IOT young enterprise, etc. In the backside of the reputation, it is the staff’s unremitting hard work and the tough struggle. By the way, the company mainly deals with RFID products, has a strict quality control system and has obtained CE authentication, enjoys a high reputation in this industry, which can guarantee to provide high quality products for people, if anyone have the demands for this field, please feel free to contact the company. For further information about Chuangxinjia, please visit his website.